Up until his death last year at age 91, writer Ray Bradbury kept a note pad by his bed and recorded his dreams. He often said that fantastical ideas would appear to him at night and he would spend the following days fleshing them out. Bradbury’s family moved to Los Angeles in 1934 and he quickly joined L. Ron Hubbard, Ray Harryhausen, and Forrest J. Ackerman at their science fiction club meetings at Clifton’s Cafeteria. In the early 1950’s Bradbury wrote his most famous novel, Fahrenheit 451, on a rental typewriter in the basement of UCLA’s Powell Library. The machine charged ten cents per half-hour and Bradbury calculated his rental cost at $9.80. Bradbury was a futurist, but never used a computer; he continued to type all of his 30 books and 600 short stories on a typewriter. 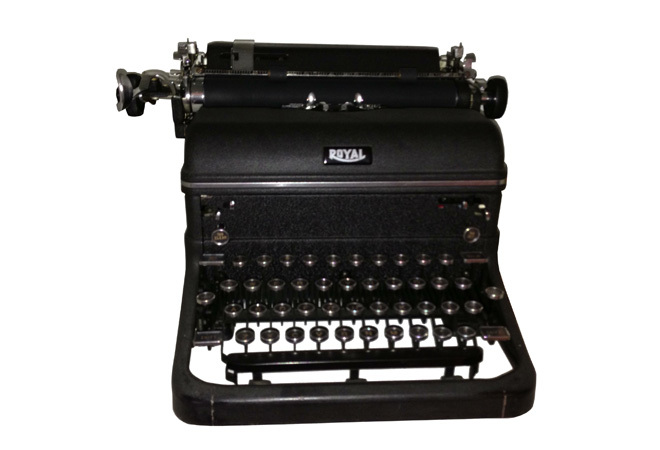 This Royal KMM was manufactured in 1947 and was in Bradbury’s home during a documentary film shoot. Producers mentioned they needed a vintage typewriter for a scene recreating Bradbury’s early years and he offered them this Royal. In 2004, Bradbury was awarded the National Medal of the Arts and in 2007 he was awarded a special Pulitzer citation for a body of American classics that includes The Illustrated Man, The Martian Chronicles, and Something Wicked This Way Comes.